Diane Alter writes: The current gold price as of July 1 represents a three-month high amid a weaker dollar and ongoing geopolitical tensions. Gold for August delivery traded up $4.70 at $1,326.70 an ounce in early market action Tuesday. At last check, spot gold was up $2.70 to $1,333.60, its highest level since March 24. Since gold's surge of more than $50 an ounce on June 19, the yellow metal has been back in the spotlight. Gold investors have recently bulked-up bullish positions in the shiny metal. According to data released Friday from the U.S. Commodity Futures Trading Commission (CFTC), hedge funds and other large gold investors added a record amount of ounces to their long positions in the week ending June 24. Long positions rose 61% to 47,784 contracts, or 4.8 million ounces. That was likely the biggest weekly increase on record, or at least since 2007 when the CFTC changed the way data is collected, according to Ole Hansen, head of commodity strategy at Saxo Bank. Short positions fell by nearly 25,000 contracts. The bullish stance comes as gold prices recover from a brutal 2013. Gold plunged 28% last year, its biggest annual decline since 1981. The current price of gold is down 31% from gold's all-time high of $1,923.70 hit in September 2011. Yet gold's solid year-to-date gains have been a bit overshadowed amid record-setting rallies for equity markets. "Many have failed to notice the fact that gold has shown a strong performance this year, and it seems that the 2013 slump is still fresh in people's minds," Michael Gayed, chief investment strategist at Pension Partners LLC, told Bloomberg. 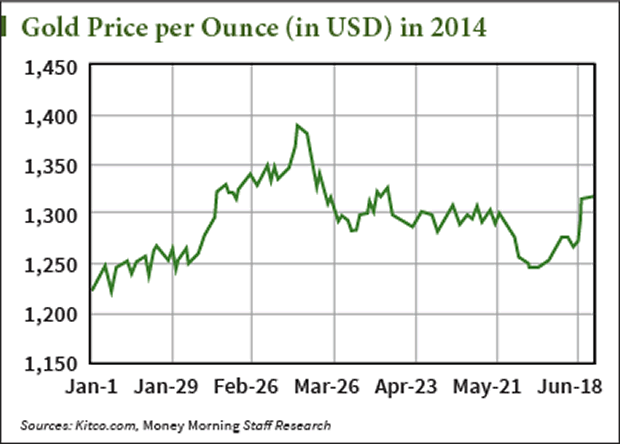 The yellow metal logged its second consecutive quarterly gain Monday, as Q2 2014 came to a close. June was the precious metal's best month since March. Gold prices rose 6.1% during June, putting the metal's gains for the recent quarter at 3%. Year to date, gold prices are up 10%, the best start to a year since 2010. Goosing the price of gold this year has been continuing tensions between Russia and Ukraine, and fears of an all-out civil war in Iraq. The yellow metal is frequently bought as a safe-haven hedge against geopolitical disturbances. Iraqi army tanks and armored vehicles arrived in the northern city of Tikrit on Sunday. It was the second day of fighting to retake the city from Sunni militants, which now occupy large parts of the country. Tuesday, mortars landed at the golden-domed al-Askari mosque, injuring at least 14 people. The shrine holds the tombs of Ali al-Hadi and his son Hassan al-Askari, both descendants of the prophet Muhammad, and considered by Shiites to be among his successors. Following the 2006 al-Qaida bombing of the revered shrine, thousands were killed and the sectarian violence put Iraq on the path of a full-scale civil war. Also on Tuesday, Ukrainian forces launched full-scale military operations against pro-Russia separatists in the east just hours after the country's president ended a cease-fire agreement. The Defense Ministry said Ukrainian forces "carried out strikes from the air and on land" Tuesday morning against separatist positions in eastern Ukraine. Societe Generale analyst Robin Bhar said the geopolitical factor is difficult to predict and that uncertainty could "keep gold above $1,300 just on its own." Gold has recently taken up its familiar position as an inflationary hedge. Inflation has been heating up in the last several months. In May, consumer prices rose at more than a 4% annual pace. Prices for beef, pork, and other food prices are soaring. Core inflation - prices less food and energy - after remaining fairly tame for several years, is also accelerating. Americans could be facing inflation greater than 3% or even 4% for the rest of 2014 and 2015. "Going ahead, economic data will guide gold prices," Jeff Sica, who helps manage $1 billion at Sica Wealth Management, told Bloomberg. The metal could see additional gains if the U.S. economy slips or geopolitical turmoil accelerates, Sica said. Sharing that sentiment is Howie Lee, an investment analyst at Phillip Futures. "This quarter (Q3), we expect gold to remain elevated or even possibly climb due to multiple uncertainties," Lee told Reuters. He added that uncertainties over the uneven U.S. economic recovery and geopolitical tensions will provide a cushion for gold. Lee also sees a positive technical picture for gold in Q3, with resistance at $1,365 and support at $1,189. Gold prices could see some action later this week. Thursday brings the closely watched June jobs report, as well as the European Central Bank's policy meeting. Money Morning recently delivered for our Members a two-part "cheat sheet" that outlines the right amount of gold for your portfolio. You can get that gold investing guide - for free - here.